The family! How much we worry about its quality of life! For peace of mind and economic freedom, we should have insurance protection against the unexpected events in life. What does individual health insurance include? These policies include the following types of coverage: implants carried out at home and abroad, operations at home and abroad, medicines not included in the national health basket, non-surgical treatments, consultation with medical specialists, diagnostic examinations, attending medical team. Newspaper headlines these days paint a gloomy picture of public medicine in Israel. 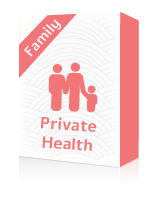 Private health insurance enables you and members of your family to turn easily and efficiently to private medical care. No need for months of waiting for your turn or for “favors” from HMOs or the public hospitals. When it comes to matters of our health, we all want the most rapid and professional care from the best physician at the most advanced hospital with a minimum chase and run-around after liability-for-payment agreements and other forms. Private health insurance allows you, in case of necessity, to allocate resources to what is really essential—you, your family and the health of all of you.